The little boys screamed and fought as they played. This was their favorite game, a game of skill they played with cadjunuts. No little village boy knew to play quietly. They always shouted and they always fought. No game was complete without a fight. Piyananda was startled by the sudden noise. He sat in the trellised verandah, reading the paper. He looked up as if he had been rudely awakened from a deep sleep and looked towards the place where the boys were playing. Suddenly, he remembered that it was the Aluth Avurudda (New Year’s) Day. He had almost forgotten! A lazy dreamer in a world of dreams, he called himself! He watched the boys at play. On the dust laden, brick-colored mud road, they had erected their playground. They ran, jumped, p1ayed about friskily. He thought of the shouting, screaming children out there! With what abandon they played, he told himself. Children had no sorrows, no regrets. They did not have to bear hurts. They were happy. Pleasure seemed to be something specially made for them. If he had a son he would be out there too, Piyananda thought. He would then watch the boy play and be happy in his happiness. His son would play, scuffle and fight, then sweat and his clothes will be damp. He would come ·to him with beads of perspiration on his nose. “¦ running, panting and breathless with happiness . . . Yes, he would speak to him sternly, making his voice sound very strict. Then the boy will be startled. He would look guilty but look at him direct. He would look at those wide innocent eyes and a thrill of joy would go through him that this fine little fellow was his son. But he would never be able to hurt the little fellow’s feelings. He might cry. If he started to cry then he would soften and speak kindly to him. At his words the little fellow would streak out like a bird and then he would come back after playing as much as he wanted to. He mustn’t stand in the way of his play and pleasure. But before he could say any more, Piyananda realized that there was no child that he called son. There was no child called Nanda except in his imagination. The running boy didn’t hear Piyananda·s words. He ran on and was lost in the thicket. He still couldn’t bear the grief of his young wife’s death. That death was the beginning of this unhappy meaningless life of his. She was pregnant when she died. How often had she told him, ”I want a son.” How often he suggested that they should call the baby Nanda. When he said this she would laugh. How he loved her laugh! They spoke of the coming child often, Nanditha and he. She wanted the baby to have a nose like hers. He would be better off with a nose like mine, Piyananda would say. What a lot of pleasure they got from this kind of inconsequential chatter! But she died before the child was born. He remembered the anguish. He remembered how he wept with her cold body in his arms. He remembered her lovely face well. Her nose. Beside it the little black beauty spot which added so much charm to her face. A tear fell on the newspaper in his hand. He didn’t even feel it. He didn’t know that his eyes were wet with his tears. The deafening sound of crackers disturbed his reverie. He settled himself once more in the armchair and decided that it must have been one of the little rascals outside who did it. He knew the fondness little boys had for crackers and how New Year’s Day sometimes was one deafening roar of crackers being lit. He remembered how it was when he was a little boy. His father used to bring him boxes of crackers for the New Year. He used to look at them and wait for the dawn of New Year’s morning. A few days before New Year, his mother made sweets. He used to sit beside her on a small bench and gobble them up hot from the pan. His mother was kind and gentle. She never scolded him. She loved to listen to his chatter, his childish words. At times, she laughed delightedly at his talk. Mother used to pack the kavums and kokis in big clay pots and store them under the bed. She would tell him firm that they were not to be eaten till the New Year. But he never waited till New Year’s Day. He used to creep under the bed and eat as much as his little tummy could tolerate and put his head out to look for his mother. When she was not around, he crept out ever so quietly. Once out, he sped out of sight and out of the house. As he remembered these events, a slight smile hovered round his lips. But it was only for moment. His mother and father were no more. He had nobody and he was far away from his village. He turned heavily m the armchair and heard the creaking and a few strips of cane snapping. He knew that in a short time the armchair will have to be thrown away. Piyananda looked at the cobwebs that filled the ceiling. A spider slowly walked along the beam and came down the wall. The plaster was peeling in some places on the wall. On rainy days, the water seeped down the wall and left damp marks in its wake. It was not a pretty sight. He knew that he was idle. It was his idleness that had brought the house to this state. What a pretty little house it was, when his wife was living. He had no more will to live. Her death had been the cruelest blow to him. He had no love for himself, for house or possession. From the day she died, he was living like a madman. Had he had the son he dreamed about, perhaps he too would have been a mischievous little boy, just as he was, Piyananda thought. He knew that most sons became like their fathers. His little son too would hover in the kitchen when his wife made sweets and eat them surreptitiously when he thought that Nanditha was not looking. He too would have been greedy for kavum, kokis and mung gedi. He could almost see the little fellow under the bed tucking into the sweets in the box. It would be stealing, but a childish game too. When he was a small fellow, villagers he knew observed every custom of the New Year. They ate at the auspicious time; they began their financial dealing at an auspicious time; they set out on a trip at a good time. They offered their parents sheaves of betel and worshipped them. When he worshipped his mother, she stroked his head and wished him the blessing of the Triple Gem. Father did not believe much in these things. He would smile and accept the sheaf of betel but he did not say anything. But he never forgot to bring Piyananda a brightly colored sarong every New Year. He would wear it and strut towards the place where the little boys played with cadjunuts, so proud, so happy. Had he been fortunate enough to be a father himself, he would have bought his son a sarong too, a bright one of many colors. Perhaps his son too would have followed the customs as he did. He too would have offered him betel and worshipped him. He would stroke the boy’s head and bless him. Nanditha too would have offered him betel, in age-old fashion like a dutiful wife. She would have worshipped him too. He would take her hands in his and hold her close. Suddenly, the noise of the playing children became louder. Piyananda was angry at this rude shattering of his daydreams. He had just come to the point in his dreaming of holding his dear wife close to him, and here he was rudely tossed into the world of reality! He saw two white butterflies fly in front of him. They must be on their way to Samanala Kanda, he thought. He had heard that they go there before they died. Nanditha had been very fond of butterflies. It would be much better if he too could go where Nanditha had gone. She must be somewhere now, in some other world, perhaps a goddess, perhaps a better human being. Was she a goddess? Would she come to see how he was spending this first lonely New Year without her? Will she be sad when she sees the wretched life he was spending without her? He mustn’t let her feel sad, he thought. He must make an effort and spend this New Year happily. Surely pleasure was not something limited to the young, to those screaming little boys out there? If it was, then grown-ups should behave like boys! Again the children screamed. This time Piyananda was not angry. He got up hastily from the armchair, threw the paper down and went inside. 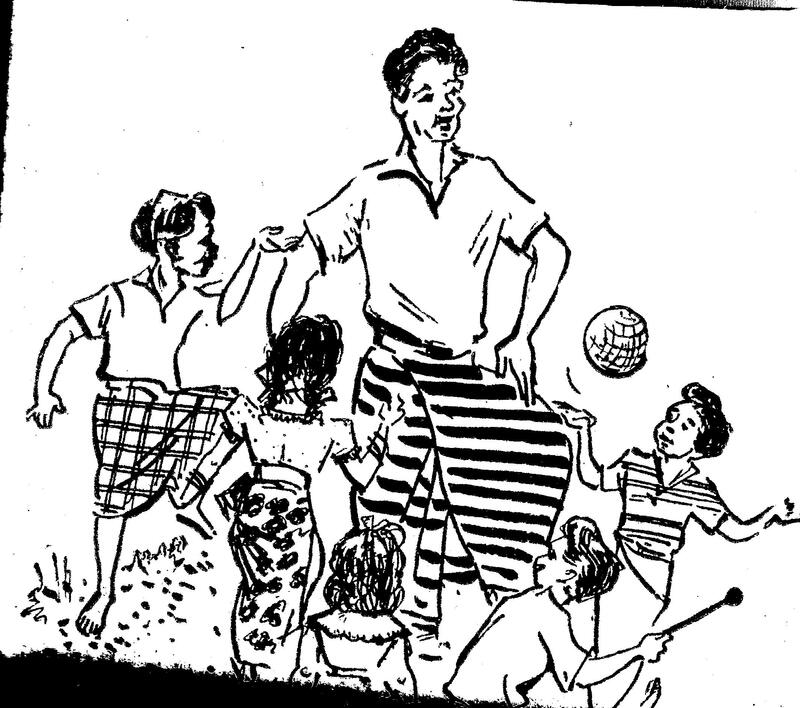 He washed and dressed quickly, wore a fresh sarong and ran to the place where the children were playing. ”Shall I join you? he asked the children. The children shouted in joy and welcomed him. They lent him cadju to start the game with. Piyananda joined in the fun. He shouted when they shouted. He fought just as they did. He won. Then he lost the cadju that he had won. He won an armful of cadju an he compared notes with the winners. He gobbled down a sweet that one of the boys gave him. He played till he was exhausted. He played and enjoyed himself. He was Nanda, a little boy out with his friends on New Year’s Day. This entry was posted on Monday, August 13th, 2012. You can follow any responses to this entry through the RSS 2.0 feed. You can skip to the end and leave a response.